You'll also notice that I will be making some changes to this site, I will removed the genre portfolios and reorganised the images by lens and by camera where the lens was fixed. This will definitely assist those seeking out images from a particular lens. In addition to this I'm going to list all the cameras I own, hopefully over time I will be able to add write-ups to them all but it may at least serve to encourage people to contact me if they have a query about a specific camera. No doubt the feature image to this post will not have gone unnoticed by some of you, I'll elaborate on this shortly, but first lets look at some of my photographic intentions. Shooting more film - I'm fortunate enough to have some of the best film cameras ever made, I'll be looking to increase the amount I use them considerably, not by reducing the amount of digital I shoot, just by shooting more!! I'm talking both 35mm and MF. Again, in relation to film, I've been building up my film stocks so you can expect to see images shot on - Portra 400, T-MAX 100, Ilford FP-4 Plus, Fomapan 100, Neopan 400 and Velvia 50 to name but a few. It's going to get interesting. There is of course more to come in the "Film Legacy" series, and I'm told of some more slides I have not yet seen so who knows! I may extend the guest post feature, not extensively but perhaps two or three a year, there are photographers out there who's work I really relate to and admire, it would be good to share some of it on here. B&W Processing - man, do I get a lot of emails about this and if I can put something together that I am happy with I will elaborate on my workflow in the coming year. I've had a request to look at the Canon 50 f/1.4 (Japanese Summilux) on the Leica M9 which I had in mind to do anyway, I will also shoot this on the M Monochrom and M6 in the same post. The 21mm Voigtlander Ultron f/1.8 should arrive around the end of January, I don't do reviews but a User Report isn't out of the question. The Zeiss Sonnar 50mm f/1.5 ZM is a recent acquisition, I'll be comparing this to the 50mm Jupiter 3 f/1.5 I think you'll be surprised at the results. I was recently offered a loan of a 90mm Summicron f/2 by a follower of this blog. Another example of the generosity and good nature of the Kiwi's. It's only had 5 mins of use on the MM and M9 and it already looks like it would make a most worthy addition to my kit. As a consequence it looks like there will be more to come from this lens. 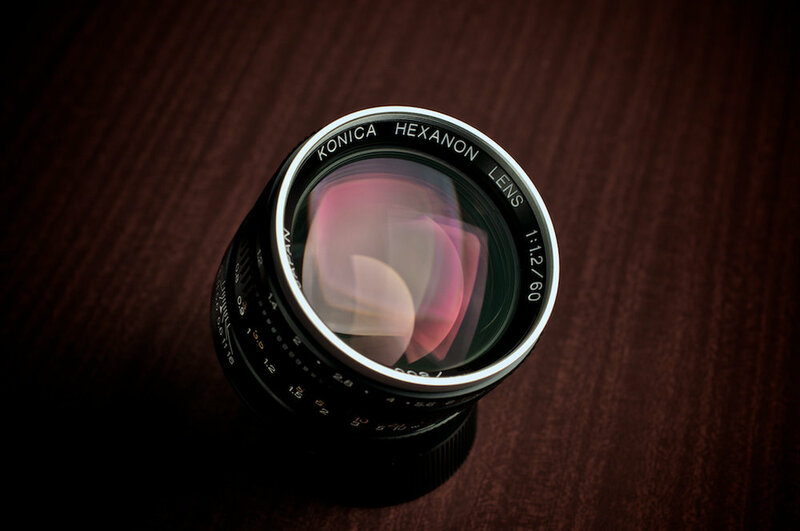 The 60mm Konica Hexanon f/1.2 is a lens I never expected to own, that's not to say I didn't hope to......well I recently got my chance and I'm now in possession of this much sought after glass. Only 800 were made in the L mount and I can't wait to get shooting with it. My work with the theatre will continue as I've made a commitment to do so, I'm sure this will lead to other opportunities over time. I'll be collaborating with various models over the year, working with available light and with strobes. This will give me a chance be creative, I've always maintained that seeing a photograph is one thing, making one is something altogether different. It's going to be interesting and exciting, dependent on how things go I may ultimately develop the studio space I have available. Exploring legacy glass on the Leica M Monochrom, if the Leica M9 was a divisive camera I'm not sure how to describe the MM......that said, many people are already achieving some interesting results and I really want to push on with this camera and this will play a huge part in my learning. I had such fun exploring some of the more remote parts of New Zealand last year that I will be planning more road trips over the year, I can't shake my love of landscapes in this beautiful country. There are one or two more really exciting projects in the pipeline but they are probably just too much in their infancy to mention in detail here but watch this space, and there are always those unexpected opportunities along with some foreign travel to Europe, the US and Japan which should all be interesting. I've thought long and hard about the frequency at which I post, it's my intention to keep things the same, which on average is probably once a fortnight. To do more is to risk the quality and as I'm always looking to improve that I think it would be detrimental in the long run, so things stay as they are. I'm open to content suggestions and I'm always willing to consider photographic collaboration. Hopefully there will be something for everyone and I can continue to build this site as a photographic resource and grow it's following at the same time.